The chief redactor of GMT Magazine met the General Manager of the Fine Watch Club. For whom is the Fine Watch Club intended ? As its name implies, for all those attracted to Fine Watchmaking, starting with lovers of luxury watches and watchmaking enthusiasts all over the world. 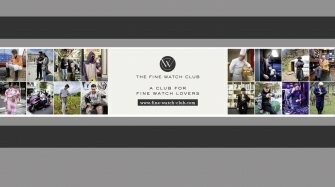 The Fine Watch Club’s mission is to bring them closer to brands and give them an inside glimpse of the watch industry. This will particularly appeal to men and women keen to get a backstage view and benefit from regular exclusive offers ; I invite them to become members without further delay. What are the benefits for members ? While the Fine Watch Club has its own gallery in Geneva and organizes monthly meetings with watch brands, it also offers a very comprehensive private sales program. Luxury watchmaking remains a closed universe for which we provide them with an “open sesame”. Members have access to a very rich and varied program, from which they can draw as they wish. Sometimes they will need to react quickly, because offers will be limited in time and quantity. Each week, they will have access to a type of offer, such as exclusive limited-edition watches created with a luxury watch brand for members of the Fine Watch Club. We are currently working with several major brands celebrating the 50th anniversary of a legendary caliber or iconic collection. Only members of the Fine Watch Club will be able to acquire one of the rare examples of models issued in conjunction with these flagship brands. In addition, we prepare event-type offers such as factory and trade show visits in VIP mode or previews, as well as special sales and offers on accessories designed exclusively for them. How does one join ? Simply by registering on the www.fine-watch-club.com website. We offer three types of membership: Three-Hands, Manufacturer and Platinum, which provide access to various benefits depending on the status chosen. Passionate watch enthusiasts will undoubtedly opt for Platinum status, which offers a “fast-track” to receive offers before others, and above all the possibility of influencing the creation process of future limited series. What’s in it for luxury watch brands ? The Fine Watch Club offers brands a real bridge between lovers of fine watches and their favorite brands, clearly identified during registration. I know of few brands that would not be interested in thousands of qualified potential customers from all over the world who are looking for a closer relationship. The Fine Watch Club already has more than 3,000 members and this number should triple by the time it is operational on a weekly basis. Above and beyond this segmentation, along with our professionalism and a certain discretion towards the distribution network, our team creates specific content for each offer so as to increase the desirability of the brand and its emotional bond with our members. Brands thus benefit from our expertise and our role as an influencer, as well as the assurance of working with a trustworthy partner. You were previously yourself the CEO of a watch brand ; how does your international watch industry experience prove valuable in your current role ? In a rapidly changing watchmaking sector, where consumer habits and distribution are undergoing substantial shifts, it is essential in a project like the Fine Watch Club to have a good vision and understanding of what a watch brand is today, with all its challenges and issues. Knowledge of the product, markets, end-customer requirements and manufacturing processes is as important as communication in order to meet the expectations of our members and partner brands. Currently in the launch phase with a first test event at Baselworld, the Fine Watch Club is opening its gallery and organizing its first activities in the spring, and plans to have completed the roll-out of its operations by fall 2019. The first factory visits and events with partner brands are scheduled for May, June and July. We have made a good start on the process of creating limited series with our designer and the product management teams of the most dynamic watch brands, which will occupy our production schedule until early 2020. They correspond to several aesthetic trends and are positioned at different price levels. Luxury is by nature rare, so it is preferable to opt for the Manufacture or Platinum status to be one of the lucky buyers !